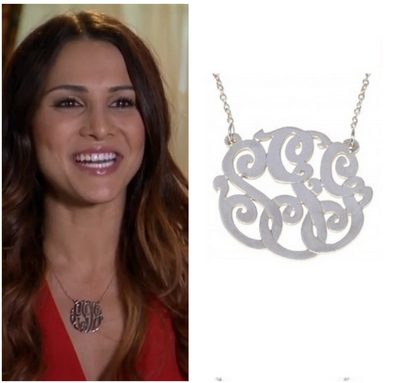 The Bachelor Expert: Happy Bachelorette Monday: Andi Inspired Monogram Necklace! Happy Bachelorette Monday: Andi Inspired Monogram Necklace! Happy Bachelorette Monday! One of my favorite parts of 'The Bachelorette' is the fashion beside the lead, drama and man tears. In celebration of the premiere I am reviewing an Andi Monogram Inspired Necklace from Accessory Mercado. Accessory Mercado is based in Chicago where my favorite celeb fashion finder Dana Weiss, the Possessionista lives. Visit Accessory Mercado to shop Andi Inspired jewels throughout the season. For all fashion finds check out Possessionista. Disclaimer: Accessory Mercado provided me with this necklace to review. I was not compensated and all opinions are my own!